I actually used to think just like this student thinks. Can you relate to this reasoning articulated in Emilio’s letter? I’ve been a Christian and a creationist all my life, fiercely against Evolution until I started my Biology course at the University and began learning about evolution. Guess what? I am still a creationist and now am also an evolutionist! It has become clear to me that the first chapter of Genesis is an allegory (if not check how it states that there was morning and evening before the creation of the Sun and Moon – an impossibility), and once we accept this there is no reason why God could not have created all there is in as many million yeas as you wish. If God created time and space, then he is outside of it and therefore is not affected by it – time has no meaning to God! 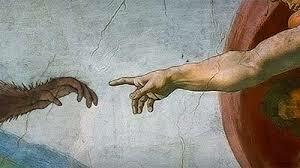 I believe that God created the laws of physics, and therefore everything that results from such laws is God’s creation. To say that the species “evolved” does not deny God’s act of creation. Quite the opposite: evolution is the science that studies how God created the species. Furthermore, evolutionism and creationism cannot be put in the same category, as one is of science, of the rational, and the other is of faith, of the supernatural. Kinda makes sense, doesn’t it? At one point it did to me. It was the perfect reconciliation of the classic argument of the Bible vs. Evolution; that is, that God used evolution over time to create everything. Formally it’s called Theistic Evolution. Personally I call it an easy compromise, perhaps even a cop-out. I remember my mother telling me that those pictures in our Life (Magazine) books at home of the monkeys turning gradually into Man were really just drawn by artists and not necessarily true. I was confused by this. She couldn’t give me any further supporting clarification on the matter – just that Man didn’t “evolve” from monkeys. She wasn’t even a Christian yet – just hinting to her young son that all that I see, hear, and read about in these authoritative books and in life are quite possibly untrue. This was a first step out of naiveté to a recognition that all I encountered in the world was fair game to be questioned and tested. I progressed into high school where, now as a young Christian myself, I sought to reconcile my growing faith with the systems and science I was being taught in school. I briefly toyed with the happy compromise of Theistic Evolution. This view proclaims that God used evolution in the creation process; that is, evolution happens and God used it over millions and millions of years. It was the perfect settlement between apparently disparate views. Yes, God and the Bible and Evolution could be held up as truth and co-exist! And one could save face in high school and college classes and in social settings. And one could go along to get along without any further questioning or researching and simply accept whatever is stated as truth by various professors and scientists and “peer-reviewed” articles/journals and TV documentaries and museum displays and polls and so-called scientific consensus. It was all too easy and too disarming. But it’s a weak compromised position to take and allows the anti-Christian, naturalist/materialist forces to dictate the terms of the debate. And it’s worked. Today most Christians, young and old, are not equipped to defend an anti-evolutionist point of view. If pressed, even unknowingly, they will default to a compromised theistic evolutionary perspective. Unfortunately, the result is that Christians and a Biblical point of view are marginalized or even patronized and labeled as “fundamentalists” – made to look like young children still holding tightly to a quaint belief in Santa Claus. And whole new naive generations, like Emilio, are being taught Darwinian evolutionary doctrine as undeniable truth. It’s an intellectually dishonest lie. Yes, a lie indeed, certainly biased and often carefully distorted, presented and perpetuated by an atheist philosophy in the academic, scientific, and media base that controls the message and the megaphone, as Phillip Johnson, the Christian Berkeley law professor and Intelligent Design proponent calls it. I learned a good lesson long ago in the business world: healthy skepticism. That is, if someone tells you something or claims something about a company or product or person, it’s always helpful and healthy to ask yourself: Who’s telling me? And why? What’s their angle or perspective? This healthy skepticism will keep you from being duped by a marketplace that always has an angle. I took the same approach with my Christian faith. It became an academic faith. As a young adult I realized that pastors and authors and teachers and heralded personalities were actually merely older people that were not infallible or always correct. In fact some, though with good intentions, were slightly or very wrong in their teachings. How did I know? I simply started researching and reading articles and books and materials that presented alternative viewpoints. This led to revelation and exposure of tenuous positions inside and outside Christianity that are generally accepted as truth by many. I do believe in evolution; that is, microevolution (small changes and adaptation within a species). I do not believe in macroevolution (wholesale changes from one species to a new one). Always be clear in that distinction; be aware of how the Darwinian atheists will mix the terms and denigrate a person as ignorant for “not believing in science.” Of course, microevolution is proven and is consistent with Biblical Scripture. Macroevolution is the unproven and dubious theory that Darwin first posed (as he observed microevolution in action – finch beak adaptation) and to which many knowingly or unwittingly still cling. Like young Emilio, reminiscent of a younger version of myself. Have you been lured into believing Theistic Evolution? 1 Defeating Darwinism by Opening Minds, by Phillip E. Johnson, InterVarsity Press, 1997, pp. 13-14.